The premise of the breakout augmented reality game Pokémon GO is absurdly simple: Players traverse a simplified version of a Google map that’s filled with Pokémon, which can be seen superimposed over real-time smartphone camera displays and caught to accumulate points. Interactivity comes in the form of fights staged at specific gym locations for which winners are rewarded with digital valuables and prestige. Created by the Google spin-off Niantic Labs, which declined to comment on this story, Pokémon GO was designed as thin layer between reality and the world described in by a video game franchise that got big in the mid-to-late nineties. What this meant for players — who have collectively walked roughly the distance to Pluto — was that the shortest path to victory was down a sidewalk. That mobilization was key for foot traffic-dependent businesses ready to capitalize on a major trend. When Pokémon GO hit its peak, so did small business investment in events intended to draw in players. Every major urban area was suddenly studded with sandwich boards advertising opportunities to trap digital animals. More than a rehash of Niantic Labs’ previous release Ingress, Pokémon GO became a business opportunity as well as a cultural phenomenon. As the first major augmented reality release — Niantic’s previous attempt Ingress set the groundwork, but never found a mass audience — Pokémon GO created an opportunity for both gamers and entrepreneurs to grapple with the potential power of a new type of technology. The gamification of the real world had numerous unintended effects and at least one clearly intended one: awareness of AR as an inevitable endgame of the mobile web. When Pokémon GO launched, the majority of PokéStops and gyms had been predetermined. It wasn’t clear what storefronts would would actually qualify or which retailers would be pulled into the game by existing maps. A week in, it was apparent that crazed fans were willing to stake out certain stops and areas to consistently reap the rewards of the same digital stop over and over. And the enticing profit returns for those rewards led to spikes in foot traffic and, consequently, business. 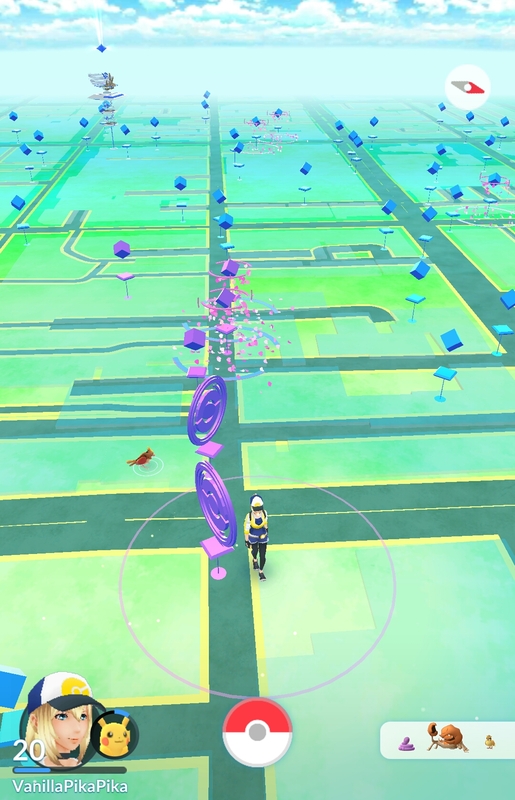 Though Niantic was not open about its means of monetizing the game, the company did deploy a functionality that allowed businesses to pay to buy and use Lure Modules, the in-game items that draw more pocket monsters to the digital stops. This is your hometown on pokestops. In a sense, the subjects of the Pokémon GO economic experiment were also the experimenters. Specific businesses were, for reasons that they could neither understand nor anticipate, host to specific PokéStops. To the extent to which that fact alone affected their business, they were the subjects in a grand-scale augmented reality test. But many of those businesses were not passive. To the contrary, many of the business touched by the phenomenon began to aggressively advertise their good fortune. One Austin location of VERTS, a Texas Mediterranean cuisine chain, threw a Pokémon Lure Party in July with an on-hand player to offer tips and tricks. The event occurred one week after the game launched and was intended to call attention to the PokéStop inside the eatery. VERTS promoted the event on social media and sent brand ambassadors out to invite local players into the restaurant. A special flyer advertised that those sharing images of critters caught at VERTS could potentially win prizes. There were businesses that accidentally stepped into the role of control as well. Dave’s Ultimate Automotive, another Austin-based business, put an electronic sign out front featuring the Pokémon GO logo and a message suggesting those driving around looking for critters should stop in to have their car serviced. The store was not a PokéStop. Whether or not they did so actively, thousands of American business and towns tracked the effects of the Pokémon proliferation by monitoring sales and foot traffic. Interestingly — and perhaps because the game truly was experimental — Niantic made no effort to compile this information for public consumption.. The store manager suggested that despite seeing more foot traffic, the story did not see a marked increase in Pokémon GO driven revenue. Unlike VERTS, Dragon’s Lair didn’t track specific numbers in order to gauge the significance of the PokéStop to business growth. Dave’s Ultimate Automotive, the autoshop that embrace pokemarketing despite not having a PokéStop, ended up tracking numbers by accident. Dave Erb, the owner of the business, said he couldn’t recall a single person stopping expressly because of the game. Even for those who capitalized on the phenomenon — either intentionally or unintentionally — the results changed over time. An initial surge preceded a drop-off as players either abandoned the game entirely or became less devoted to hunting new pocket monsters. “It’s kind of died off now,” says Biona Miller, manager of Maxine’s Cafe & Bakery in Bastrop, Texas, a town briefly known for its myriad of PokéStops. “It was more big when everybody was really, really into there at the beginning — all of Main Street had way more foot traffic.” Miller said that foot traffic during the height of the craze did lead to an increase in sales. Unlike its predecessors, Pokemon GO reached a critical mass of players and became a cultural event. Though it remains slightly unclear how Pokémon GO affected commerce, it is absolutely clear that it did. For businesses that rely on foot traffic, it was better to be in the app than to not be — and that will likely continue to be the case going forward. Bastrop municipal employee Becca Pentland noted that hunters were notably more numerous around her town’s Main Street Gym location after a recent update. Niantic has, at this point, demonstrated the continued value of Gyms and PokéStops, which can be driven largely by releases made over time. But the company is only starting to monetize that. Niantic announced in December that it would partner with Starbucks, creating PokéStops at 7,800 coffee franchises across the country. That announcement coincided with a similar announcement of a deal with Sprint to create PokéStops and Gyms at 10,500 of the carrier’s retail locations nationwide. Sprint and Starbucks are likely just the beginning for Pokémon GO and Pokémon GO is likely just the beginning for augmented reality. The simplistic game, much maligned despite its massive user base, stirred millions of people around the world to explore their neighborhoods — and other neighborhoods — in a new way. A technology that can provoke that kind of reaction has immense value to both game makers and any company in the retail industry, which has struggled over recent years. Pokémon GO proved that AR technology can move people, which might make it a unique interface and a savior for a certain kind of business and a certain kind of town. Pokémon GO won’t save America’s Main Streets, but it points to one way in which communities might be able to save themselves one gamer at a time.